There is so much to love about this planet. For one, it's a planet filled with many species, who co-exist in harmony. From the majestic lion to the humble giraffe, there is something truly special about the animals that roam in the wild and their beauty is unrivaled in nature. Toy makers, CollectA agree with these sentiments, which is why it has created a collection of miniature scaled replicas to pay homage to Wild animals. CollectA is one of the world’s largest makers of toy replicas, and they share the public’s interest in the wild mammal species. Therefore, they make realistic replicas of a variety of species for educational purposes – raising awareness about the importance of protecting endangered species and reducing our environmental footprint. 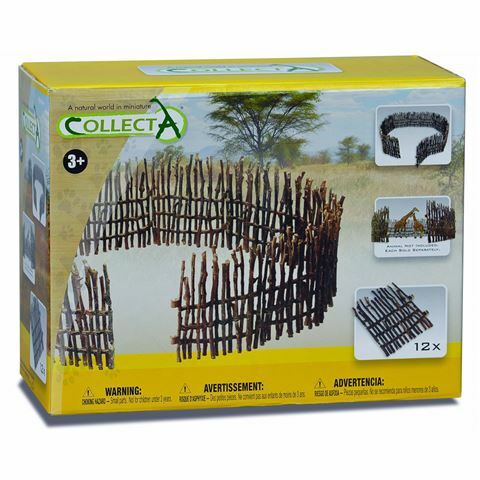 Made from durable plastic, the Boma Fence is designed to house your CollectA replicas. Just like the real thing, this boma fence includes various smaller fences, which fit together to suit your needs. You can make the fence bigger to accommodate larger creatures like giraffe, or smaller to house a lion. It even features realistic hand-painted details to give children and adults, alike, a realistic representation of these handmade wooden fences. Made from durable, BPA-free plastic. Miniature scale replica of a boma fence, with hand-painted details. Includes twelve fence sections that fit together to suit your needs. Designed for use with CollectA's Wild Life collection (sold separately). Individual Fence Dimensions: 10cm (w) x 12cm (h).